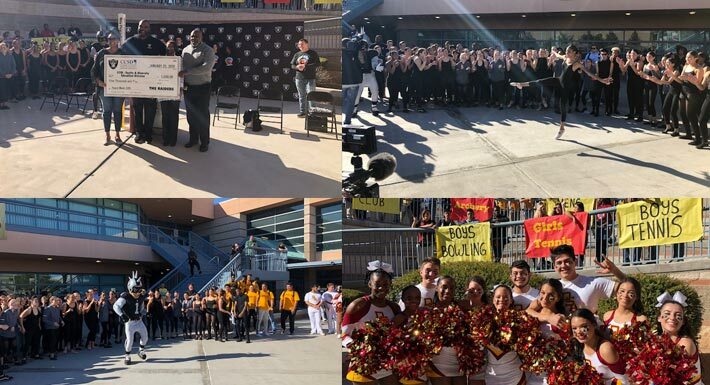 Schools throughout the Clark County School District (CCSD) observed Peace Week in Nevada with a variety of activities, but perhaps the best one took place at Del Sol Academy of the Performing Arts. Representatives from the the Raiders organization, including Raiders Alumni Roy Hart and James Harris, were at the school to dedicate a Peace Pole on the campus and participate in a Peace Walk through the campus. Multiple student clubs and performance groups participated in the event, that included a check presentation. The Raiders awarded a $5,000 grant to CCSD’s Equity and Diversity Department. The funds were used to purchase Peace Poles and Peace Week T-shirts that were awarded to 25 different schools throughout the district in support of Peace Week. The primary goals of Peace Week were to build a culture of peace and provide opportunities for schools to make progress toward building this type of culture.